4 Bedroom Detached House For Sale in Yarm for Asking Price £460,000. 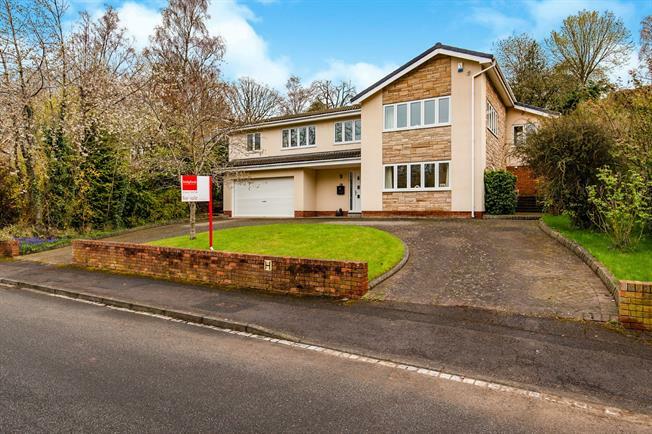 This delightful family home offers light and bright living space, and generously sized bedrooms. The flexible layout offers various ways to best use the space, depending on your needs. With mature gardens to the rear, and plenty of parking and double garage to the front. This elegant room has a picture window to the front with a lovely outlook, and further windows to two sides ensuring its light and bright. With an attractive wall mounted electric fire, coving, ceiling light and radiator. Recently refitted, and offering stylish and contemporary wall and base units and central island in cream high gloss, with contrasting black granite work tops. Integrated dish washer, space for 5 ring range and American style fridge freezer. With a large picture window to the rear looking out into the garden. An open arch leads into the dining area, which has bi fold doors leading out onto the patio area. With coving, spotlights and ceiling light. Door leading into the utility room. Window to the front with lovely outlook, and further window to the side. External door to the rear. Wall and base units in cream gloss, single sink and drainer. Space for washing machine and tumble drier. Laminate flooring, spotlights and radiator. Wide and spacious, with a contemporary oak and glass balustrade. Picture window to the front. A great sized room, fitted with a stylish white suite comprising of a free standing bath tub, step in shower cubicle, vanity unit with twin wash hand basins and WC. Fully tiled walls and floor. Extractor fan, spotlights. Frosted window to the front. A stunning white suite comprising of an egg shaped free standing bath tub, wash hand basin in a vanity unit and WC. Step in corner shower cubicle, wall mounted heated towel rail and extractor fan. Porcelain tiled floor and part tiled walls. Frosted window to the side. . Window to the rear with views of the rear garden. Radiator and ceiling light. Window to the rear. Ceiling light and radiator. Door to en suite washroom. Low level WC and wall mounted sink. Spotlights and extractor fan. Offering an impressive first impression, the newly installed oak and glass hand crafted staircase leads to the first floor. With oak flooring and large storage cupboard. Doors to bedroom two, the snug and internal door to the garage. Spotlights and coving. A charming room, full of light from the picture window at the front. Ceiling light and radiator. Door to Jack and Jill shower room. Accessed from both bedroom two and the snug. Contemporary white suite comprising of a step in shower cubicle, wall mounted wash hand basin and WC. Tiled floor. Remote controlled roller door to the front. Window to the side. Range of wall mounted storage cupboards. Internal door into the hall. The rear garden is terraced, with several paved seating areas and an expanse of lawn. There are several fruit trees, and mature trees and bushes. To the front there is an area of lawn, with a block paved crescent driveway leading to the double garage.